This past weekend I had the pleasure of hosting the great pianist/composer Sunna Gunnlaugs and her band (check her out here) for a double-bill gig at the Buttonwood Tree, and I offered to provide the pre-gig meal as well. Sunna is dealing with a significant range of food intolerances, so my task (which I chose to take on, as Sunna herself said she was content to essentially fend for herself) was to come up with a meal that was satisfying for a van full of hungry musicians while avoiding (among other things) wheat, gluten, soy, dairy, fruit and vinegar. I came up with a 3-course meal that was well-received (whether due to quality or musicianly politeness I’ll leave you to speculate). There was a chilled brown rice salad with vegetables (garden snow and snap peas, garden garlic scapes, corn, cherry tomatoes) and nuts (toasted pecans and almonds) with a simple salt/olive oil/lemon juice dressing. The “main course” was a baked lentil “loaf” (although it didn’t hold its shape too well) which was basically cooked brown lentils mixed with a “sofritó” of sautéed onion, red pepper, garlic and tomatoes) and some salt, pepper, oregano and cumin, with a couple eggs to bind it all together. The biggest hit, though, was ironically the simplest dish. I had been planning a mushroom soup when I found out that fungi were off limits as well. Only moderately daunted I had a rare moment of fairly comprehensive culinary inspiration (as opposed to being inspired to change 1 or 2 ingredients in an otherwise reliable dish, or doing something from the seat of my pants and having it turn out not so well). This dish was tasty and REALLY EASY – I dare say that it might even be worth trying even by folks who aren’t looking for dairy alternatives (UNLESS those folks have nut allergies – sorry). If you already have a bulb of roasted garlic, we’re looking at 15 minutes total. If not, that’s super easy (see notes) but will require an additional 45 minutes of mostly waiting around, which ideally can be done in advance when you’re using the oven anyway. See the notes after the recipe for more info on that. 1) Heat up the water in a pot or kettle. Measure out the cashew butter. 2) Scoop the roasted garlic guts (I just spear them with a small paring knife) into a small/medium bowl (even a soup/cereal bowl is fine) and mash with a fork. Plop on top of the pile of cashew butter and scrape the pile of glop into a medium to large saucepan or soup pot. 3) When the water is hot, turn the heat under the soup pot up to medium and pour about a cup of hot water in along with the salt, whisking vigorously to keep the mixture smooth. Over the course of the next 5 minutes or so, add a cup of water at a time, continuing to whisk. 4) Once all the water is in there and you have a nice, thick broth, whisk in the herbs. Immediately thereafter, discard the whisk and switch to a wooden (or plastic) stirring spoon and add the spinach. 5) Stir/cook until the spinach is just soft (will be very quick if using fresh, a little longer if frozen) and then you’re done. – To roast garlic, first preheat an oven to 375 (or thereabouts – if you’re already baking something at 350 or 400, just adjust your timing a little). Peel off the outer layer of papery stuff, leaving the bulb intact (e.g. the cloves still attached). Chop off the very outer bit of the pointy side, exposing a little bit of each clove. Spoon or brush a little bit of olive oil over the now-exposed part and wrap loosely in foil. Throw in the oven for about 40 minutes, until the garlic guts have become quite soft. Voila! – If you like the basic broth part, many other lightly-cooked vegetables could be substituted – had we had them in the fridge (and/or had we not been using them for other dishes), I might have been inclined to use red pepper, Swiss chard, beet greens, broccoli or Vidalia onion. This is an awesome recipe lineup. I love the challenge of cooking within tight restrictions–brings out creativity in ways one normally would not be inclined to go. 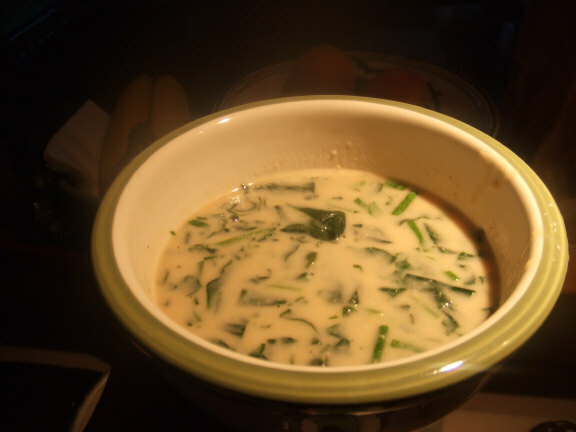 I will definitely be trying the “Cream” of Spinach Soup. We are working on recipes for Kale at our house as the garden in overflowing with it at the moment.